Now, that app is receiving a major update that brings the ability to record and replay digital drawing sessions. Muro Redraw lets users draw, record and watch art as it is created. With this major update, artists and observers alike now have the ability to speed up and slow down each digital brush stroke, allowing users to take a deeper glimpse into the artistic process of other creators. It’s an interesting tool for sharing techniques and educating newcomers, as revealing each and every step should help to inspire inexperienced illustrators while making the entire community a little more intimate. Click here to see the app in action. Our in-house development team is dedicated to driving real innovation in the arts, extending education for both amateur and professional artists alike, and Redraw is another example of that commitment. The masters of traditional art have given us paintings to admire, but the methodologies of their practice will never be fully unearthed. Now with the new and improved deviantART muro featuring Redraw, the creative process of our current masters can be preserved to inspire and enrich future generations to come. The HTML5 app is notably compatible with iOS, all modern browsers and Wacom drawing tablets. 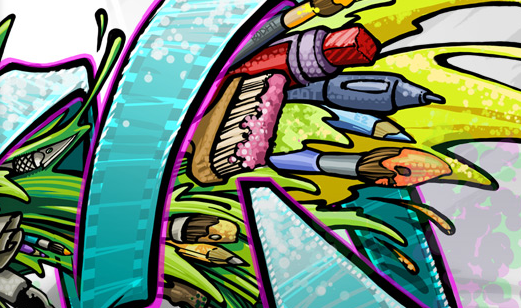 Overall, it’s a major release for anyone that’s involved in or curious about the online art and illustration community. The fact that the app is entirely free makes things even better, showing just how much deviantART cares about its long-time users.